I am not a fan of the rustic look or the shabby chic look. This is a small coffee table I made for my girls play/media room. This table will be (and already has been) colored on, painted on, spilled on, and probably jumped on. To be honest I put really minimal effort and materials into this table. I made it the weekend after Christmas so we could finish their new place to play with Santa’s goodies. It needed to be quick and I used materials I hand on hand. The top is from a nasty piece of red oak I found in the garage when we moved in. It was rough sawn and looked like it had spent a lot of time outside at some point. It was sufficiently dry and milled well. I am not a fan of red oak. The second to last picture shows why. That is the underside of the top with just polyurethane. I don’t like the uneven coloring and the deep red cathedrals in oak. The last picture is the top. I pore filled it with timbermate. Major difference. 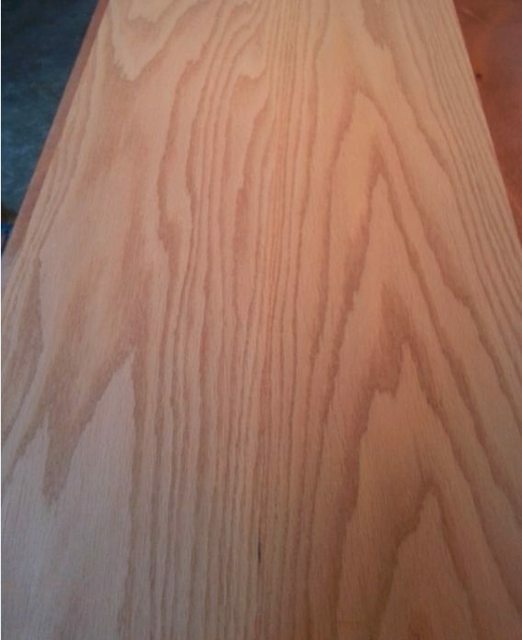 The finish is simply 6 coats of Minwax semigloss thinned and foam brushed on – no sanding between coats. It went down really nice. After it cured for a few days I rubbed it out with steel wool and paste wax. The legs in on backward! The tapers looked cool this way mocked up, but not so cool as a finished product. Oh well. Very nice indeed! Love the finish applied to the top as well.Thanks for posting. I really like this for a quick and dirty assembly and finish. Something to be proud of. The girls won’t destroy it any time soon Note if you don’t like the tall cathedrals of red oak then don’t ever try to use cypress, as they peel back when planed like cellophane. and it splits easily even with just 18 ga. brads if too close to an edge. 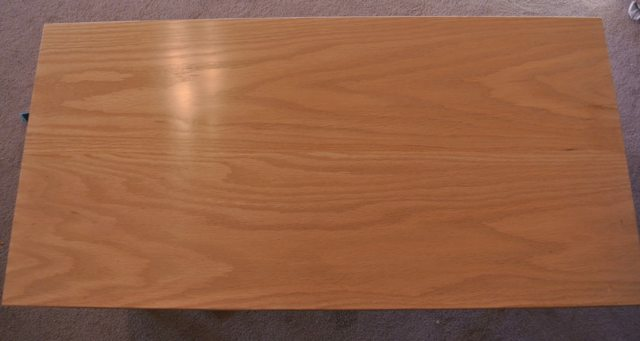 Did the same thing with the tapered legs on a coffee table I built. I don’t care what anyone says I think it works. Nice job. Nice work Joe. I’m with you on not liking “the rustic look or the shabby chic look”. I Googled the “timbermate” you mentioned. Which shade did you use? This is Tasmanian oak coloured Timbermate. Even sanded and unfinished, I already knew I wanted to tone this red oak down. The Tasmanian oak is lighter than the red oak, so the cathedrals almost disappeared. Timbermate is fantastic stuff. By far the best filler I have used. It’s water based so easy to apply and dries an about an hour. It doesn’t shrink, it sands really easily. Also you can reconstitute this stuff forever. There is no shelf life. You can even freeze it and it’s still fine. Unlike with some other water based fillers, I had no adhesion problems with the finish after. I know it is simple, but 3 hours??? I need some lessons from you. Way to go on the table. Looks like it can take a beating and will serve you well. I totally agree with you on the red oak. Not a huge fan at all. It does look much better filled and finished. Nothing fancy here. Measure, joint, cut. pocket hole, sand and assemble. The half sheet sander makes quick work of panels. Lumber Joe, I’m certainly not finding fault cuz I’ve already stated how impressed and like this build, but for an education stand point, why are your top planks reversed with the cathedrals running in opposite directions? 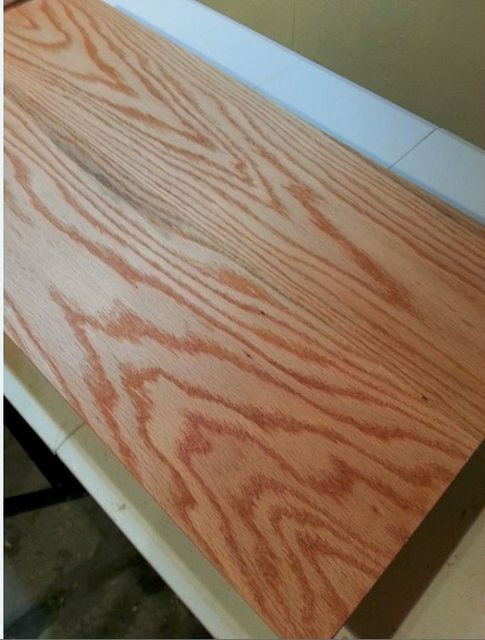 I use both red oak and cypress with the tall cathedrals and usually try to joint so they go in the same direction. Dimensional stability. This came from a 10” wide board of unknown age and origin. I suspect it was air dried.i wanted to alternative growth rings.